Democrat Ilya Sheyman said Wednesday that he'll take on Republican Robert Dold, who won the seat last fall. Dold defeated three-time Democratic candidate Dan Seals to help the GOP hold onto the seat held for five terms by Mark Kirk, who won President Barack Obama's former U.S. Senate seat. Sheyman says he's raised more than $100,000 toward his campaign. Congratulations on the fundraising, but did you follow all the federal election guidelines for fundraising? How much money can someone raise before they are required to file with the Federal Election Commission? New Elgin Mayor Dave Kaptain said he just wants the state to send what it promised. "I don't like being threatened and I don't work real well under those circumstances," Kaptain said. Hurrah for the new Mayor! Kevin McDermott: Whatever happened to the downstate Democrats? In a recent paper, Jackson used electoral data to show that “Illinois clearly suffers from an intense regionalism ... especially polarized along the geographical fault lines dividing the rural and small town areas from the cities and the suburban areas.’’ The ongoing Republicanization of southern Illinois, he wrote, is one of the starker indications of that fissure. I haven't read the paper yet but I have a feeling that fault line runs down Cook County considering how the Townships split on Quinn. Illinois's not as Blue as you'd think, and it's changing. I still can't figure out how AG Madigan can go after Pabst's on the design of a can, while the rest of Springfield seems to pile on for joints guised as healthcare. Consumers ain't the dumb guys. We'll know drink and toke when we see 'em. This weekend, the newly formed Fox River and Countryside Fire/Rescue District will begin offering service to more than 21,000 people. And when that happens, District Fire Chief Greg Benson said he expects perfection. “It will be flawless,” Benson said of the scheduled Sunday service switch from the St. Charles Fire Department to its own operation. Pray he's right. I'd still like to see a petition started to elect our Fire Commission. Getting to this point has not bee flawless. Let's hope the Chief's right and the outcome is. Purging Blagojevich from History. Via Pantagraph.com. As Rod Blagojevich’s second federal corruption trial got under way last week, the scrum of media covering the sequel is smaller, there are fewer people attending the trial and the daily news briefings are less bombastic. It seems pretty clear that a lot of people just want to forget Blagojevich and his antics. Turns out, even some of his staunchest defenders during his six years in office seem to agree. Recently, Becky Carroll, a loyal mouthpiece for Blagojevich during his first term in office, was hired by new Chicago Mayor Rahm Emanuel to oversee the Chicago public schools PR efforts. Included in the press release distributed out by the Emanuel folks was Carroll’s biography, which listed her previous jobs in Chicago City Hall, as well as time spent on Barack Obama’s presidential campaign. It even lists her role as a communications person for the Chicago Fire Soccer Club. Nowhere does it mention Carroll’s service to the state’s taxpayers as a member of Team Blagojevich. Similarly, former Blagojevich budget chief John Filan recently took a new job with a financial advising firm. A page-long resume on the company’s website notes that he also served as director of the state budget office. That's very Soviet of Illinois. When Progressives start talking about Congressman Ryan gutting Medicare, you really ought ask them about Obamacare's Independent Advisory Board. Rationing doesn't begin to describe the vast powers granted the IPAB. Jameel al-Assad. Syrians inside Syria are reporting that Jameel al-Assad, a Maj. General and an important military figure in the regime, died today as a result of a gunshot fatal wound. After giving orders to shoot at demonstrators tomorrow, it seems one of the soldiers taking orders turned his rifle and shot him dead. The soldier was immediately ushered to safety by others. If the story is true, it marks a major tuning point in this Revolution. Homs. Security men and the army has disappeared from the city. Possible reasons: 1) Aleppo may erupt tomorrow and Assad needs all the help in this 5 million plus city. 2) Homs is lost and Assad needs to retreat to Damascus to protect his rule. Sednaya Prison. Beirut Observer is reporting that 4 Salafi prisoners were put to death for refusing to testify, on tape, they were behind the murder of Syrian army soldiers. It seems the Salafi accusation is not sticking so the regime tried to implicate real Salafis. Bill Lavicka's done a lot for the near West Side. The City ought to bend over backwards to help this guy. Roger's in The Thinker on Berwick going Free Marketeer. Berwick's sudden conversion to a non-rationing mentality must not be trusted for a microsecond. The doctor once advocated "a cap on total spending, with strictly limited year-on-year growth targets." There's no way around the fact that the statement blesses government-enforced rationing. In fact, in a June 2009 interview, Berwick flat-out asserted, "The decision is not whether or not we will ration care-the decision is whether we will ration with our eyes open." I noted two weeks ago that Berwick's "cavalier dishonesty illustrates the deep-seated contempt that [he] has for truth." But Berwick is also afraid. The man is unwilling to try to defend his ridiculous earlier positions. Yet Dr. Donald Berwick almost surely still "loves" British-style rationing and detests the free market. But the doctor is counting on his powers of "influence" being so strong that "weak-minded" Americans don't notice his duplicitous behavior. Remember the Doc's made his fortune as Showman and Evangelist. His contempt for us is that of PT Barnum. The video I've been waiting for and the speech I'm sorry I missed. Rep. Barbara Flynn Currie: ...if it is feasible to present the maps early, the committee will do so. After the hearing, (Rep. Barbara Flynn) Currie said the redistricting often comes down to the wire, leaving little time for an early release. But she said if it is feasible to present the maps early, the committee will do so. Geez, curries a progressive reformer and she can't show Illinosians maps that will impact us for a decade before the hearings on 'em? Quinn must find Illinoisians awfully stupid not to see through this. I'd rather crooks just stand tall --Betty Lauren Maltese like walking proud into the Fed Court House-- rather than tell us gibberish like Quinn does about Careen Gordon. It's quid pro quo for Gordon's vote on the onerous tax hike. Now she needs a job with benefits in return. When it comes to Political Paybacks, Illinois Governor Pat "Huckster" Quinn has absolutely no shame. Matter of a fact, Quinn has shown a propensity for rewarding and protecting cronies ever since the tax increase passed. This, in spite of perpetrating a shameful sham on Illinoisans that an Income Tax Hike was absolutely crucial to pay our bills and that he would make the necessary cuts to stop the bleeding in state government. Well, that increase has done nothing to date to alleviate the fiscal mess, nor has the governor made the necessary cuts when it comes to patronage and obscure shadow government boards. Democrats get elected in Illinois because so many of us think it's this Where's Mine? philosophy that keeps Illinois from falling apart. Quinn absolutely believes this too, and he ought be honest enough to defend it. From Kass today but I heard Blagojevich yesterday AM on Wade and Roma say it. Sure makes you wonder about Fitz and the way the Feds selectively editorialize about things making Lincoln roll in his grave, but then go silent when asked about very odd coincidences like this. In the last trial, prosecutors said pro-Jackson businessmen were willing to pay some $1 million to Blagojevich's campaign in exchange for the governor naming Jackson to Obama's vacant seat. "If I'm a conspirator — bring it on," Jackson snarled in a interview last year with Don Wade and Roma. Shortly after, Jackson suffered a bimbo eruption involving a blonde swimsuit model. Blagojevich suggested the information came from FBI documents, though he did not offer proof. "… Then all of a sudden somebody leaked, and I'm not so sure that the government is supposed to be leaking information on FBI interviews, but they then embarrassed him and leaked his FBI 302 (report)," Blagojevich said. "I believe it's them. I'm not sure. But it sure looks like it. "He said, 'Bring it on' and the next day there was a big story in the paper … that humiliated him with his other problems," Blagojevich said. A spokesman for the U.S. attorney's office in Chicago declined to comment about the latest Blagojevich rant. We can't attract businesses, so we add to our already large collection of thugs. The never-ending death penalty debate has been given new life by a British Columbia man. DuPage County prosecutors say the man decided to hunt down and kill his ex-girlfriend in Illinois only after determining that he wouldn’t face the executioner. The 36-year-old woman was shot numerous times in the head as she walked out of the Oak Brook office where she worked. If the man had done a little more research, he would have found out how easily many murderers get off in Illinois — death penalty or not. On average, murderers convicted in the state are locked up for less than 15 years, according to the most recent data published by the Illinois Department of Corrections. Way too much at stake. My bet is Blagojevich cops a lesser plea and no jail time. No way Justice Department is going to let this get out of control with testimony. Holder sits on Fitz to make it happen. Tell me it ain't gonna be so? Illinois politics is all about money and lists. It's a political great accounting to sort out everyone's where's mine? Fitz wants everyone to chat about Blagojevich's suits --which afterall were made by a Chicago company-- and doesn't want anyone to know about Fitz's deposition of his boss President Obama. That doesn't serve the public interest to sort out what really happened in Illinois. Forget the suits Mr Fitzgerald. Give us the facts. The point cannot be made often enough: Modern liberalism, as embodied in the Obama presidency, is the defender of the status quo. And the status quo is a road to economic ruin. The dancer's aft shown to NBC for writing about $50K donations for Rahmo inaugural fun. Rahm ran as kid over his tan. He ain't so tough after all if he has to run from this bunch. Hightailing it's gonna be his style. On Tuesday, April 19, at 7 p.m., come to the Bar DeVille for our Theology Pub Night. Meet up and hoist one with Pastor Dave to connect with other Porchers and have good conversations about life, spirit, and beer. I'm guessing Bessie camped out at the Federal Building today catching a glimpse of the Prez going in for a chat with Fitz before next weeks trial. Proof will be Blago in a few days asking for a copy of that transcript. What's not played, will never be heard. The court seals it all up for eternity. We'll lose a lot of history from the Blagojevich era. Maybe that's the idea. More wacky Cicero news. Something's building up and going to bust. After he left Cicero, my step Dad kept reading the Cicero paper because the only real news was Cicero news. This Editorial shows why. Ok Bessie, well, whatever we say about the lack of vigor from the Feds in the first trial, Fitz doesn't seem to sleep. What a neighborhood Nyak lived in. Him on one side of the street and Alsammarae on the other. Imagine the block party. Video on Rep Weiner's request for a waiver on Obamacare's requirements on the cap on insurance plan's admin expenses. Many union plans can't meet that, not can NYC's. Am I the only one highly suspicious of an Obama administration official who originally left to work with David Axelrod on the Obama reelection team, now heading over for a high-profile position within a means of communication? Representative Todd Rokita (IN-4) said on a conference call the shutdown's about spending and not social issues or riders. If he's presented with a bill that cuts spending he'll vote for it regardless of Planned Parenthood funding (and he's 100% plus pro-lifer). It's all spending and the social issues have been largely resolved. Update: And it sounds like Rokita's well lead: read Boehner’s leadership is tested in the budget battle. Rokita admitted he wasn't privvy to all the details. Like what exactly did largley resolved mean? At times, it was unclear whether Boehner could hold them together as the budget talks dragged on. Last month, 54 Republicans voted against their leadership on a bill to keep the government operating for an additional three weeks. It was another mark of their new trust in the speaker that freshman lawmakers did not demand the details of his negotiations with the White House. The Speakers building a team. Hurrah for Speaker Boehner! Update: It looks like it all went per plan. As I’ve reported, Negotiation 101 tells us that a good negotiator gets the other side to “buy” something your own side doesn’t care all that much about. You keep two issues open and trade them off at the end. Boehner did have something going for him: a completely incompetent White House. The errors include never having an alternative short-term continuing resolution on the table (letting the GOP’s short-term CR be the only “stop the shutdown” document out there for two days); not stepping in to signal that the troops would be paid in some fashion; issuing an incomprehensible veto threat with no alternative; overestimating Boehner’s need to get the Planned Parenthood rider; and underestimating Boehner’s ability to make this about the most popular issue (cutting the deficit). These major White House errors compounded the error of never getting a 2011 budget done when there were large Democratic majorities in the House and the Senate. Via The Chronicle... Congrats Patsy! CAMPTON HILLS – Incumbent village President Patsy Smith handily won re-election Tuesday over write-in opponent Kristin LeBlanc, according to unofficial results. Smith received 64 percent of all votes cast Tuesday. Her opponent’s write-in votes will be counted Wednesday, Kane County election officials said. This is Smith’s second term, after an appointment as village president when the village was created by referendum in 2007. And someone notes... Brenda appears to leave out the fact that in addition to Patsy's first 1 year appointment she was also elected to one 3 years term prior to this reelection. 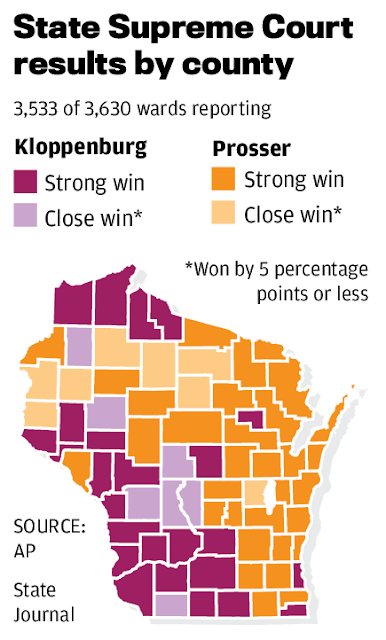 Too close to call and it will got to recount, but the map below interesting. Liberals get the boonies, Madison, and Milwaukee. It is the end of an era for Elgin. David Kaptain will be the city's new mayor after unseating 12-year incumbent Ed Schock. With all precincts reporting, Kaptain claimed victory with 3,921 votes to Schock's 3,291. Kaptain gave up his council seat to challenge Schock, saying he wanted to give voters a choice between qualified candidates. Because I attended the March 16 AFLA-sponsored Elgin mayoral debate, I would like to share some of my impressions. Many topics were discussed, but I will focus on just two: spending priorities and illegal immigration. On spending priorities, Mayor Schock vigorously defended the $700,000 that was wasted rebuilding a Judson University baseball field for a women’s professional softball team that, lacking ticket sales, left Elgin. He defended giving the Prairie Rock restaurant $165,000 and, when they pulled out, gave more money and police security to a fight club that assumed the Prairie Rock location. Being an inappropriate idea to begin with, the fight club also failed. My favorite outrage was the deal he made with a developer that went sour after taxpayers paid for the demolition of a valuable community asset — our old library. The mayor had the audacity to say that given the same circumstances, he would do it all again. When I look at appropriations of $3,037,790 for an auto mall, $607,740 for car dealer incentives, a riverfront promenade and an artist colony that are included in Elgin’s 2011 budget, I believe him. On the topic of illegal immigration, the mayor banged his hand on the table demanding that before anyone dared criticize him, they should provide proof that any other community did a better job controlling the influx of illegals. Since he knew that no one could provide such documentation at a moment’s notice, I believe his anger was manufactured to intimidate his audience. I left that meeting knowing that Mr. Kaptain would get my vote, and here’s why. I see Schock as a man who has an agenda that will continue to burden taxpayers with wasteful spending. I think he has held office long enough, and I have huge problems with his past performances. I think Kaptain will fairly address the aspirations of all citizens, and that his genuine respect for the rule of law will guide him in achieving this. So, for those analysts in the press who think that Obama will win in 2012 if incomes are still being propped up by massive (deficit financed) government spending, real salaries are declining or flat, unemployment is far above the historical trend, good paying jobs are scarce, the deficit is at an all time high, and the president has no real idea about what to do (except, of course, high speed rail), I have only this to say: you might want to think twice before you place that wager. This president is not yet out of the woods on the economy. Not even close. Look at the graphs. I think it might be not just out of the woods, but digging a deeper hole. Al-Azm: The absolute remoteness from the methods used in earlier protest movements. Formerly, banners would have been emblazoned with slogans like "Death to America, Death to Israel" or "The enemies of the people don't deserve freedom". Such sentiments suddenly vanished. And the break with them did not take place gradually, but rather abruptly. In earlier protest movements there was always a climate of crisis. Now things were completely different. We are now experiencing a protest movement in the Arab world that toppled a president while music was played, people danced, recited poetry and released balloons into the air. This resembles what we are familiar with from Europe or the USA. The days of the earlier protest movements are not so long past. We need only think of the protests against the Danish Mohammed caricatures or the "Satanic Verses" by Salman Rushdie, or the demonstrations for Palestine. We are now witnessing a new sprit and a new practice. This attests to a high level of maturity. Even the religious statements we heard were of an individual nature. Anyone who wanted to pray did so. Anyone who did not want to pray didn't have to. Anyone who wanted to stand under the cross went ahead and did it. Great, so here's what happens with my income tax increase. That's District 69 Democratic State Representative Dave Cheatham (Dave Cheat 'Em) comparing his retreat to Illinois to avoid doing his job to soldiers being deployed to Afghanistan to fight for their country. Disgusting. Our soldiers are leaving home to do a job serving their country by going to Afghanistan. The Democrats ran away from doing their jobs serving the people of Indiana by fleeing to Illinois. The soldiers in Afghanistan are fighting and dying. The Democrats aren't in pitched combat. Their lives aren't in danger. They're not dying. There is no comparison here, and Dave Cheatham shouldn't be making one.